It’s very rare when I get a chance to write about my interest in film on this blog. When there’s a foodie connection, I just knew I had to write about it. That’s assuming I can squeeze into a jam-packed theatre. I can’t say I was impressed with the venue, the Empire Theatre (formerly known as Capitol 6) that the Victoria Film Festival uses. The individual movie screening rooms felt small. And after seeing another film at the Odeon half a block away, if this movie was shown there, they would’ve accommodated the dozen or so stragglers who wanted to see the film, but were denied due to the film being sold out. Thankfully, my patience won out and I managed to see this movie, and it certainly had me hungry at the end! The acting is very sublime and the subtitled translation is good. What I particularly enjoyed about this movie is its enduring quality: the look at the human condition of being torn away from civilization was at the heart of this film. When the lifeline is only a phone call away, just how many people really want to pay $8 a minute just to talk with loved ones, or even to the operator at the opposite end of the line. The look at the daily life at Fuji Dome, a research station located deep in Antarctica, is certainly a heart-wrenching one. A team of seven scientists and a chef have to eke out the best of a tough situation. They have to spend more than a year in isolation. Surprisingly, the comedy that ensues is hilarious. They have enough supplies so they can survive the long tenure, and the trivia one learns about food and survival training is fascinating. Chef Nishimura (Masato Sakai) narrates parts of this film as though he was writing it down into a journal. And this detail isn’t far from the truth. 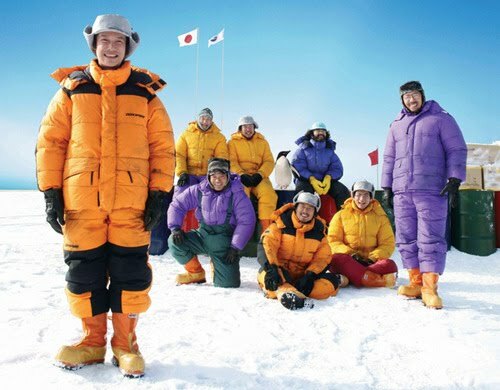 This film is based on the real events that took place in 1997, to which the real Nishimura detailed his life at the bottom of the world in his essay, Omoshiro Nankyoku Ryōrinin. In the film he reveals that an average person consumes about a tonne of food per year, and that the only two things he can grow in the extremely cold conditions are radishes and bean sprouts. As a chef, Nishimura knows his stuff. But there’s one detail which I found troubling. Given the hints of his culinary experience, shouldn’t he also be a gastronomist? The quintessential staple, next to miso and rice, in the Japanese diet is ramen, and it’s made from wheat flour, salt, water, and kansui. But what is it? To the non-Japanese viewer, they will be scratching their heads at this mystery ingredient. I admit that, like the station captain Taichō (Kitarô) in the film, I don’t know what kansui is either and I do love my ramen. Restaurant served or instant, I savour them both. I’m very picky about my flavourings and will say if what I’m eating will give me indigestion or not. Taichō finally learns that kansui is a mineral water containing elements of sodium carbonate (baking soda) along with a few other chemical compounds. Upon that sudden realization, Nishimura abandons what he’s doing and serves up the meal of kings. That left me licking my lips as the crew of Fuji Dome were happily eating their ramen and slurping down the broth. Anyone planning on seeing this movie should definitely have a filling meal before watching this film. It’s 125 minutes long and the length becomes noticeable when the movie stops showing the calendar counting down the days to home. One really has to wonder when the movie ends. The film doesn’t tell you, and that’s a cunning way to put audiences into the same trials and tribulations the scientists are going through. But after the theatre, if you were feeling just as hungry as I was—a trip to Japanese Village just won’t do. I need to travel to Japan to find myself a fried lobster! Or, in this movie’s case, watch it again since it’s available to purchase on Amazon. This entry was posted in Film, Reviews and tagged Japanese, Movie Review, Ramen, Victoria Film Festival. Bookmark the permalink. Great review. I was at the screening on Wednesday and loved the movie. It left me starving for Ramen like no ones business!